Food for Thought: ‘Tis the season to be jolly! It’s the season to be jolly, with the holidays coming up, but not everyone has a reason to be happy. Families with children who rely on local food pantries to help them through the month, for whatever reason, certainly can lose holiday joy. Hunger hurts everyone, but it is especially devastating to children. Having enough nutritious, healthy food is critical to a child’s physical and emotional development and their ability to achieve academically. Children facing hunger may perform worse in school and struggle with social and behavioral problems that impact their ability to learn. Good nutrition, particularly in the first three years of life, is important for establishing a good foundation for a child’s future physical and mental health, academic achievement, and economic productivity. According to the United States Department of Agriculture (USDA), 15.3 million children under 18 in the United States live in households where they are unable to consistently access enough nutritious food necessary for a healthy life. Although food insecurity is harmful to any individual, it can be particularly devastating among children due to their increased vulnerability and the potential for long-term consequences. The Kansas Food Bank serves 215,300 people annually, including 68,900 children and 19,900 seniors from 87 Kansas counties. Among all clients, 14 percent are black, 37 percent are Latino, and 42 percent are white. Eleven percent of adult clients are students. Fourteen percent of households include someone who is a veteran or who has served in the military. According to the 2013 figures Kansas Food Bank figures, the Frontier Extension District has 7,310 food insecure individuals – Anderson County has 1,180; Franklin County has 3,850; and Osage County has 2,280. Did you know that 84 percent of client households with children reported purchasing the cheapest food available, even if it wasn’t the healthiest option? What can you do locally? ECKAN, East Central Kansas Economic Corporation, is the community action program for Frontier Extension District. ECKAN has a food pantry to help families who cannot buy food for their families. A list of items needed by ECKAN can be found on the Frontier Extension District web page www.frontierdistrict.k-state.edu. The following list was supplied by ECKAN, however the healthy items listed are appropriate for any family needing food assistance (Hope House, Help House). Needed are canned vegetables, instant mashed potatoes, canned tomatoes (diced, whole, stewed, sauce, and juice), canned fruit in fruit juice rather than syrup, 100 percent juice (individual serving sizes could be used in a packed school lunch or for a snack), spaghetti sauce, chili, canned chunky soups and beef stew, products like Manwich, canned or dried beans, canned meats like tuna, chicken, ham, turkey, Spam, sausages, dried pasta and rice, macaroni and cheese boxes that don’t require other ingredients, low sugar breakfast cereals and oatmeal, pancake mix and syrup, and coffee. Don’t forget the personal products that are an important part of our lives. Baby diapers and baby wipes are needed. Other daily living needs are toilet paper, deodorant, feminine products, shampoo, conditioner, body wash, soap, laundry soap, dish soap, tooth paste, tooth brushes, and Depends. Other ideas for offering your support include your own church’s food pantry, a homeless shelter, a shelter for abused women and their children, and even the family who lives down the block from you with children in need. 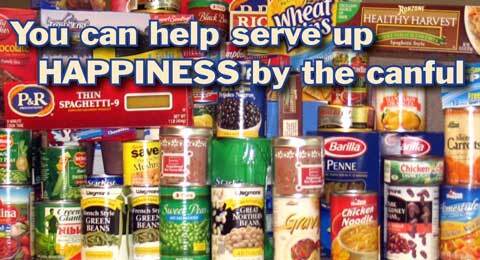 Participate in the many food drives that community groups sponsor. There are families working at low pay scale jobs. They need our help this time of year to make the holidays a little brighter. ‘Tis the season to be jolly and nothing I know of makes you feel better than doing something for someone else.